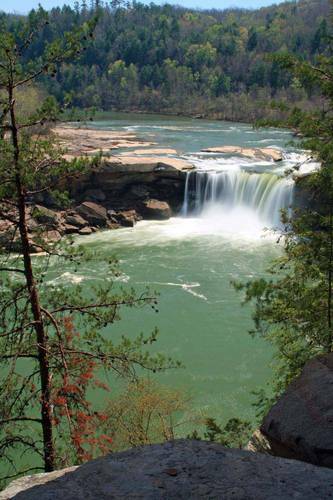 Cumberland River and Cumberland Falls in Cumberland Falls State Resort Park in KY. Shot from the Eagle Falls trail. Thanks for your comments. The falls look totally different from this side than they do from the visitors center on the other side. I will look through my shots and see if I have a picture taken from there. I know I don't have any "serious" shots but I may have a snapshot or two. These falls are huge and this particular shot doesn't really show that. For those of you near corbin ky, or that can travel there, they do a wonderful nature photography weekend ever year in April. I took this shot along with the dog slaughter falls shots during that time. It's a great weekend. Contact the park for info. What a beautiful spot to just sit there in the shade - on that huge rock and watch and listen to the water plunging over the falls that are so beautiful and white!! I notice they look more blue above the falls and green after they have come tumbling over. I can hear them - delightful!!! A beautiful scene and a great vantage point.